An online bachelor’s in English degree may lead to a variety of rewarding career paths. For example, the Bureau of Labor Statistics (BLS) projects that the demand for technical writers will grow 11% between 2016 and 2026. The English language is highly versatile and is used almost universally across different cultures and industries. The way we use it, and what we use it for, changes constantly. From the impact of the internet on language to the continuing relevance of Shakespeare, online English degree programs continue to evolve with the times. What Will I Learn in an Online Bachelor’s in English Program? University of Central Florida ranks #1 on The 25 Best Online Bachelor’s in English Degree Programs! Based in Orlando, the University of Central Florida is one of the largest universities in the country, with a total enrollment of more than 66,000 students. The school is also home to a popular distance education program that includes an online English degree with tracks in literature and technical communication. Both degree pathways consist of 120 credits and feature fully online courses with no required campus visits. The literature track explores the historical, social, cultural, and theoretical significance of fiction, poetry, plays, and nonfiction through close reading and analysis. Students develop skills in reading, writing, critical thinking, and argumentation by studying the history of literature and by examining periods and movements from the past several centuries. Electives allow degree candidates to focus on specific time periods or countries, with courses like Gothic literature, Caribbean literature, post-World War II fiction, and Hispanic women writers. Online learners also complete at least one linguistics or theory course, such as feminist theory or modern English grammar. The technical communication track offers many of the same courses but focuses more on the professional applications of writing for business, science, and other fields. Students gain a deeper understanding of practical writing processes through courses such as technical writing style and literature of science and technology. Degree candidates complete several literature courses but electives emphasize rhetoric and composition, such as writing for the computer industry or writing for hypertext. UCF is regionally accredited by the Southern Association of Colleges and Schools Commission on Colleges (SACSCC). University of Memphis–UM Online ranks #2 on The 25 Best Online Bachelor’s in English Degree Programs! The University of Memphis is home to two fully online English degree programs: African American literature and professional writing. Both degrees build skills in written communication, reading, and analysis but do so using different areas of study. The African-American literature concentration examines the historical, cultural, and artistic contexts of black literary movements, while the professional writing concentration builds skills related to the technical side of writing. Regardless of their concentration, degree candidates complete a 12-credit program core, which includes three foundational literature courses in British literature to 1750, British literature since 1750, and American literature to 1865. Students complete the core by taking one of three electives: introduction to linguistics, persuasive writing, or advanced composition. 21 concentration-specific credits, including both required classes and electives, make up the remainder of the curriculum. Learners in the African-American literature track explore the development of black authors throughout history, moving through the Colonial Enlightenment and slave narratives into the Harlem Renaissance and beyond. One of the concentration’s key components is an extended study of 2–3 writers, and students build critical analysis skills by comparing the aesthetics of different authors. The professional writing track builds skills in technical writing, professional editing, and online writing. Students gain a broad understanding of practical writing skills, with elective options that include web design, document design, and the publishing process. The professional track also features an optional internship component that allows candidates to build experience in a professional writing environment. U of M is regionally accredited by the Southern Association of Colleges and Schools Commission on Colleges (SACSCC). University of Massachusetts–Lowell ranks #3 on The 25 Best Online Bachelor’s in English Degree Programs! Building knowledge related to literary traditions, analytical methods, and academic research, UMass Lowell’s online BA in English degree trains students to become critical readers, writers, and thinkers. This fully online program requires no campus attendance and enrolls students from around the country. The bachelor’s curriculum consists of 120 total credits, while the English major itself requires 36–54 credits. Candidates complete required courses in the form of a program core, a theory/composition component, and a major author component. The core curriculum builds foundational knowledge in the field of literature, focusing on British and American literary traditions. The theory/composition section consists of one course that builds a learner’s analytical perspective on literature and language. Finally, the major author component offers sustained study of canonical writers, such as Shakespeare, Chaucer, or other selected literary figures. Electives comprise the remainder of the English curriculum; students may take up to 36 English elective credits to fulfill their overall degree requirements. These courses focus on various topics, including genre, literary history, regional movements, and literary traditions. Classes that cover drama, comedy, poetry, journalism, and autobiography explore specific forms in greater depth, while classes in gay and lesbian literature, post-colonial literature, and American women novelists highlight underrepresented writers. Students can also pursue genre-specific courses, such as science fiction and fantasy, mystery writing, and the horror story. University of Illinois at Springfield ranks #4 on The 25 Best Online Bachelor’s in English Degree Programs! Students enrolled in the bachelor of arts in English program at the University of Illinois at Springfield benefit from a flexible, fully online format that offers a large degree of self-paced learning. All English majors receive individualized support from an academic advisor, who helps students identify academic/professional goals and determine effective course selections. The English department also works in conjunction with the Teacher Education Program at UIS, assisting candidates who plan to pursue teaching licensure alongside their online English degree. The English curriculum consists of 68–71 credits, including foundation courses, core courses, and several free and required electives. The 34-credit foundation component covers key topics like linguistics, world literature, British literature, and American literature. The 22-credit core emphasizes literary study through courses such as rhetoric and composition in digital media, digital technologies in English studies, and research methods in English studies. Core courses run throughout the program and conclude with a capstone project where students apply their academic interests to a professional context, such as academic or commercial publishing. Electives cover a variety of literary topics, with three required components that introduce degree candidates to genre, editing, and writing. Students select one course from several options for each of these components; for example, the genre section offers courses in poetry, fiction, drama, and film. Along with these required electives, students choose four additional 300- or 400-level courses in any area of literature. UIS is regionally accredited by the Higher Learning Commission (HLC). Saint Mary‐of‐the‐Woods College ranks #5 on The 25 Best Online Bachelor’s in English Degree Programs! A Roman Catholic liberal arts college based in Indiana, Saint Saint Mary‐of‐the‐Woods serves a small student body of around 1,700 individuals. The school’s online English degree explores both practical and creative approaches to reading and writing, examining the impact of literature on cultures around the world. The program also emphasizes the literary contributions of women and other underrepresented groups. SMWC offers a fully online curriculum, with no required visits, and a primarily asynchronous delivery format that allows online learners to complete coursework at their convenience. The undergraduate curriculum consists of 125 total credits, while the English major requires a minimum of 43 credits. The English curriculum includes introductory and advanced topics, giving students a broad overview of trends in literature alongside specialized studies focusing on different periods, movements, and styles. Some of the program’s notable courses include literature and myth, pop fiction, and contemporary world literature. All degree candidates can complete a four-credit senior thesis/capstone project where they perform extensive research into a literary topic of their choice and present their findings in the form of a comprehensive paper or other approved format. The project lasts two semesters, beginning with a three-credit preparation course and concluding with a one-credit thesis course. Participants also have the option to enroll in a one-semester study abroad experience at Regent’s College in London, which offers advanced perspectives on British literature. SMCW is regionally accredited by the Higher Learning Commission (HLC). Arizona State University–ASU Online ranks #6 on The 25 Best Online Bachelor’s in English Degree Programs! Enrolling over 25,000 students through online courses, Arizona State University is one of the largest distance education providers in the country. Among these distance offerings is the school’s online bachelor of arts in English, which features a flexible curriculum that explores topics in literature, linguistics, literary theory, criticism, and the use of the English language. The program positions fiction and nonfiction texts in social and historical contexts, emphasizing issues of literary representation, including race, ethnicity, class, and gender. ASU offers this degree entirely online, with no required campus visits. Students can choose from multiple enrollment dates throughout the year. This online English degree typically takes around four years of full-time study to complete, although ASU also offers an accelerated program that can be completed in just three years. The English major includes just three required courses, offered at the beginning of the program: first year composition, advanced first year composition, and critical writing and reading about literature. While ASU requires learners to take several other humanities courses and a language component, degree candidates complete the remaining English credits by enrolling in a wide selection of electives, including courses in environmental issues in literature and film, transborder Mexican and Chicano/a literature of the Southwest, science fiction studies, and publishing in literary magazines. Distance learners can also participate in an online internship offered through ASU’s online literary journal — the Superstition Review. This internship provides participants with experience in the submission, selection, and editing processes used to produce a literary magazine. ASU is regionally accredited by the Higher Learning Commission (HLC). Thomas Edison State University ranks #7 on The 25 Best Online Bachelor’s in English Degree Programs! Based in Trenton, New Jersey, Thomas Edison State University emphasizes self-directed learning and caters to working students. Fittingly, the school offers a strong distance education program that includes an online bachelor of arts in English. All of TESU’s undergraduate degrees include a liberal arts core that emphasizes five main areas: intellectual and practical skills, civic and global learning, knowledge of human cultures, understanding the physical and natural world, and general education. The English major curriculum includes core courses, electives, and a culminating liberal arts capstone. The 12-credit core builds foundational skills in reading and includes two literature survey courses as well as classes that focus on the analysis and interpretation of literature. The 18-credit elective component allows students to explore different literary movements, genres, and authors. English majors choose from more than three dozen elective offerings, including courses that cover the American political novel, comic and satiric tradition, restoration drama, social protest literature, and the Augustan age. As part of the school’s general education requirements, degree candidates complete 27 additional elective credits, which may include more English courses. The English curriculum concludes with a three-credit liberal arts capstone course, which consists of a major project in an area of English selected by the student. Learners have the option of completing a research project, creative project, or some combination of the two. University of Colorado Denver ranks #8 on The 25 Best Online Bachelor’s in English Degree Programs! One of the first schools to offer a fully accredited distance education program, the University of Colorado Denver now ranks among the largest online learning providers in the western U.S. The school’s online bachelor of arts in English writing is a professionally focused degree that prepares students for careers in the writing world. Unlike many other online English degrees, this program emphasizes the practice of effective writing and editing rather than the study of literature. As such, the curriculum focuses on rhetoric and all types of composition, including general writing, professional writing, and creative writing. Courses can be completed entirely online or on campus, allowing students who live nearby to mix and match learning formats. The English writing major requires students to complete a minimum of 39 credits, with a program core that allows candidates to choose from several foundational courses, including introduction to writing studies, multimedia composition, language theory, and special topics in rhetoric and writing. Students then select three required elective courses from options such as technical writing, argument and logic, proposal and grant writing, and principles and practices of second language acquisition. Finally, students pick five additional electives in any area of language, literacy, or digital media. CU Denver encourages hands-on learning, and all online students gain access to the school’s experiential learning team, which helps connect distance learners to study abroad programs, internships, and other professional experiences. English majors commonly carry out internships in the fields of business and advertising, publishing, entertainment, and journalism. CU Denver is regionally accredited by the Higher Learning Commission. Valley City State University ranks #9 on The 25 Best Online Bachelor’s in English Degree Programs! Based in eastern North Dakota, Valley City State University hosts a bachelor of science in English education program that prepares graduates to serves as English teachers in secondary schools. The program is available entirely online, and VCSU offers in-state tuition to all students, regardless of their location. The degree requires students to complete a total of 120 credits, split between general education requirements, the English major core, and a professional education sequence for secondary education majors. The English core consists of 42 credits and includes courses in language, composition, literature, and communication and media studies. Learners must take classes from each of these areas. However, many of these components offer a selection of course options; for example, to fulfill the composition requirement, students can select from courses in media writing, public relations, technical and science writing, and literary publications. Additionally, the literature component includes required courses in American, English, and world literature alongside specialized classes such as critical theory, Shakespeare studies, and young adult reading and literature. The teaching component features 32 credits of coursework, preparing degree candidates for teaching certification upon graduation. Aspiring educators learn about different perspectives of education and pedagogy, with classes such as educating exceptional students and understanding cultural diversity in education. A significant portion of the curriculum is dedicated to hands-on learning, and all candidates must complete a four-credit practicum experience and a 10-credit student teaching experience, both performed in a secondary school. VCSU is regionally accredited by the Higher Learning Commission (HLC). The online English degree program is fully accredited by the National Council for the Accreditation of Teacher Education (NCATE). California Baptist University–CBU Online ranks #10 on The 25 Best Online Bachelor’s in English Degree Programs! The city of Riverside is home to California Baptist University, a private Christian liberal arts school that offers an online bachelor of arts in English. This degree trains students to evaluate and analyze various forms of literature, emphasizing critical thinking and written communication. The curriculum presents an introduction to literary forms fused with CBU’s Christian ethics. Offered in a fully online format designed to accommodate working students, the program uses primarily asynchronous delivery, giving learners the freedom to complete coursework at their convenience. Graduates can pursue careers in various areas of writing, publishing, and editing or pursue graduate studies in related fields. CBU also offers an accelerated course format that allows some candidates to complete degree requirements in as few as 16 months. This online bachelor’s degree in English literature features 39 major-related credits. Lower-division requirements consist of a survey of major global literary movements, including British literature, American literature, and world literature. Upper-division courses introduce specialized topics surrounding the study of literature and languages, such as literary theory and criticism, language structure and acquisition, and Shakespeare studies. Students complete nine additional upper-division electives, building advanced knowledge of specific literary movements, genres, or periods. CBU also offers an optional creative writing concentration that requires learners to earn an additional 12 credits; this concentration enables students to explore varied compositional styles, including fiction, nonfiction, and poetry. CBU is regionally accredited by the Western Association of Schools and Colleges (WASC). Central Washington University ranks among The 25 Best Online Bachelor’s in English Degree Programs! Based in the city of Ellensburg, Central Washington University is a state school that serves over 11,000 students. The university’s bachelor of arts in English: professional and creative writing degree combines a liberal arts foundation with studies in literature; creative writing; and various forms of professional writing, including scientific, business, and technical. This program also focuses on editing and publishing, giving graduates a broad perspective on the overall field. Students earning their English degree online complete a minimum of 74 quarter credits, split between a 32-credit program core; 27 credits of writing electives; and 15 credits of literature, linguistics, and film studies courses. The program core introduces key topics in creative writing, rhetoric, English grammar, and writing for editing and publication. Electives consist of coursework in creative writing, professional writing, and a practicum; students select from several options to fulfill each component. For example, creative writing options include introduction to playwriting, fiction writing, and screenwriting fundamentals, while the professional writing section offers coursework in copy editing, grant writing, and web writing fundamentals. All online learners must complete at least two credits of practicum courses, which build hands-on experience and enable students to observe professional writing practices up close. CWU offers practicum opportunities specifically for distance learners, but students can choose from several other options, including literary editing, literary design and production, and cooperative education. CWU is regionally accredited by the Northwest Commission on Colleges and Universities (NWCCU). 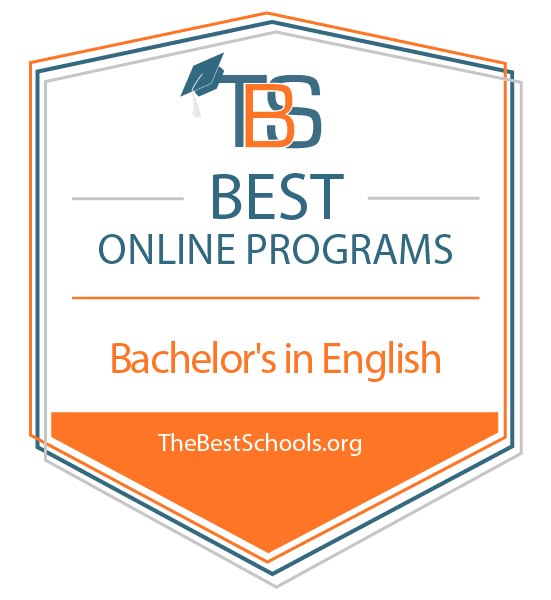 Ottawa University–Online ranks among The 25 Best Online Bachelor’s in English Degree Programs! A Christian liberal arts school based about 50 miles southwest of Kansas City, Ottawa University serves more than 7,000 online-only students through a comprehensive distance education program. The school’s bachelor of arts in English places literature in social and cultural contexts, examining the evolution and impact of literacy movements while emphasizing issues of social and environmental justice. The school also offers a variety of complementary minors, including philosophy, communication, marketing, and theological studies. Ottawa formats its distance education program to accommodate working professionals, and all courses use a fully online, asynchronous format that requires no campus visits or set login times. Additionally, the school’s generous transfer policy allows students to transfer up to 80 credits of previous undergraduate coursework toward their bachelor’s degree. Students earning their English degree online complete survey courses, theme-based courses, seminars, and a capstone project. Survey courses present a broad overview of literary history, tracing the development of literary forms from antiquity through the postmodern era. Theme-based courses explore various literary movements and authors, such as multicultural literature, protest literature, environmental literature, and literary criticism. Two seminar courses focus on critical approaches to British and American literature. Students also complete one course in linguistics and one course in either expository or creative writing. The program ends with an integrative criticism capstone course, which allows students to demonstrate their understanding of literary history and the different approaches to literary criticism. Ottawa University is regionally accredited by the Higher Learning Commission (HLC). Southern New Hampshire University ranks among The 25 Best Online Bachelor’s in English Degree Programs! While Southern New Hampshire University operates a main campus in the city of Manchester, the school may be best known for its extensive online program, which serves more than 90,000 students around the world. Catering to working adults and students with significant obligations outside of class, the university offers a fully online, fully asynchronous course delivery format that allows learners to work through course materials at their own pace. The school also maintains a generous credit transfer policy that allows individuals to apply up to 90 previously earned credits toward a bachelor’s degree. SNHU’s online bachelor of arts in English language and literature builds skills in research, communication, critical thinking, and writing through the study of literary classics. The curriculum for this online English degree includes three required foundational courses: the English language, literary theory, and Shakespeare studies. Students go on to select eight additional elective courses that explore specialized literary topics, such as popular and contemporary fiction, renaissance and restoration literature, and nature writers. SNHU also requires candidates to complete one creative writing workshop, choosing from options in fiction, nonfiction, poetry, and playwriting. English majors can pursue either a thesis or non-thesis option. The thesis option requires extensive research on an approved literary topic, resulting in the creation of a substantial research paper that demonstrates a student’s understanding of literary history and theories of literary criticism. The non-thesis option requires candidates to complete two additional upper-level literature electives. Granite State College ranks among The 25 Best Online Bachelor’s in English Degree Programs! A public college based in Concord, New Hampshire, Granite State College is home to a bachelor of arts in English language arts with a teacher certification option, training degree candidates for careers in education. This fully online English degree offers three certification pathways: early childhood education and early childhood special education, elementary education and general special education, or general special education. Students can also pursue a non-certification pathway that includes fewer course requirements and no certification exams. Regardless of their concentration, all students complete both an English language arts core and an education core. The English language arts core offers an overview of literature and literary criticism, with courses like British literature, expository writing, disability in literature, and conducting critical inquiry. Each certification pathway includes several required education courses, which vary between tracks. The early childhood track, for example, includes coursework in child development, young children with exceptionalities, and special education law. All candidates also complete an extensive education field experience in a supervised classroom setting, drawing connections between education theory and professional practice. Individuals seeking teaching certification must take the Praxis Core Academic Skills for Educators Exam, and specific certification pathways require various additional exams. For example, students in the early childhood education and early childhood special education track must also complete the Praxis II-EC Education of Young Children Exam and the Pearson Foundations of Reading Exam. GSC is regionally accredited by the Commission on Institutions of Higher Education of New England Association of Schools and Colleges (NEASC). King University ranks among The 25 Best Online Bachelor’s in English Degree Programs! A private school affiliated with the Presbyterian Church, King University operates a main campus in Bristol, Tennessee. The school also hosts a popular distance education program, which offers a bachelor of arts in English that explores the relationship between literature and faith, emphasizing writing and communication skills in the context of literary study. While the program prepares graduates for a variety of career paths, the curriculum is designed to lead to secondary education licensure. Students can complete the fully online major requirements in as few as 16 months. The degree curriculum includes a total of 124 credits, with 48 credits dedicated to major-related coursework. The English curriculum features 12 courses that offer a broad overview of literary movements and styles, including Appalachian literature, British romanticism, adolescent literature, and literature and the Christian imagination. The program curriculum meets content requirements for secondary teaching licensure in English, preparing graduates to serve as English teachers for grades 6–12. Candidates seeking licensure must also complete several education course requirements and eight credits of foreign language coursework. This online BA in English degree concludes with a comprehensive final exam. All candidates also assemble a portfolio that includes three examples of strong writing work, representing a student’s development throughout the program. Distance learners must explain why they picked each writing sample. This portfolio also serves as a useful career tool, demonstrating a student’s skills to potential employers. King University is regionally accredited by the Southern Association of Colleges and Schools Commission on Colleges (SACSCC). Clarion University of Pennsylvania ranks among The 25 Best Online Bachelor’s in English Degree Programs! Part of the Pennsylvania State System of Higher Education, Clarion University is home to around 5,000 students. The school’s bachelor of arts in English stresses analytical writing, critical thinking, and communication through the study of literature and other forms of writing. This flexible degree can be completed entirely online with no required campus visits. The curriculum includes 42 credits of major coursework, divided between an English core and multiple specializations. The 18-credit core introduces reading and writing through courses such as introduction to English studies, writing for the major, and introduction to the English language. Specialization courses build focused knowledge in one of four key program areas: literature, creative writing, general writing, or linguistics. The specific requirements for each specialization vary. For example, learners in the creative writing track take coursework in autobiographical writing, documentary writing, and the craft of fiction. Clarion also offers a certification pathway for secondary English education, preparing graduates to teach English in grades 3–12. This certification requires candidates to complete additional education courses and teacher certification exams. Clarion is regionally accredited by the Middle States Association of Colleges and Schools (MSACS). The education certification pathway is fully accredited by the Council for the Accreditation of Educator Preparation (CAEP). Nicholls State University ranks among The 25 Best Online Bachelor’s in English Degree Programs! Thibodaux, Louisiana is home to Nicholls State University, which is a public school that serves more than 6,000 students. The university’s bachelor of arts in English builds skills in writing, research, speaking, and analysis, while simultaneously introducing learners to the study of Western literature. This fully online English degree offers three concentration areas: literary studies, creative writing, and writing and rhetoric. The English program requires students to complete a minimum of 120 credits, with 36 credits allocated to required English courses and 18 credits allocated to concentration courses. All participants complete a selection of foundational courses that introduce basic concepts of literary criticism and major figures in American and British literature. Additional electives let students study specific literary movements and periods, such as modernist literature, postmodern literature, and southern literature. Concentration courses build specialized skills; for example, the creative writing concentration includes courses in nonfiction prose writing, creative writing in three genres, and a creative writing seminar in prose or poetry. The program ends with a capstone course where students reflect on what they have learned, identify and explore career options, and prepare for life after graduation. Students also compile an academic portfolio and complete an intensive research project on a literary topic of their choice. Candidates in the creative writing track complete a longform creative work instead of a research paper. Nicholls is regionally accredited by the Southern Association of Colleges and Schools Commission on Colleges (SACSCC). East Tennessee State University ranks among The 25 Best Online Bachelor’s in English Degree Programs! Based in Johnson City, East Tennessee State University offers an online bachelor’s degree in English literature with both teaching and non-teaching pathways. The program uses a primarily online format that allows students to complete most coursework from a distance; however, ETSU does require occasional campus visits for classroom sessions where learners collaborate and network with classmates and faculty members. Both the teaching and non-teaching pathways require candidates to complete 36 credits of English major requirements, including literature surveys and courses in language or literary criticism and author studies. The curriculum features few required courses; instead, students choose from several options to fulfill credit requirements. For example, the survey component requires candidates to select one course in British literature, one in American literature, and one additional survey course in any area, while the author section requires students to explore the works of Shakespeare, Milton, or Chaucer. The teaching track consists of 24 credits of education courses, covering key topics such as educational psychology, exceptional learners, reading instruction, and educational technology. Candidates also complete a significant residency/field experience that focuses on instructional methods and assessment, school curriculum, and methodology. The residency requires a total of seven credits, including a three-credit section dedicated specifically to teaching English in middle and high schools. Students who forgo the teaching track complete a minor worth 18–24 credits in a related subject, such as anthropology, foreign languages, history, or philosophy. ETSU is regionally accredited by the Southern Association of Colleges and Schools Commission on Colleges (SACSCC). University of Maryland–University College ranks among The 25 Best Online Bachelor’s in English Degree Programs! A public school located in Adelphi, the University of Maryland University College offers a bachelor of arts in English that builds cultural literacy and skills in reading, writing, and critical thinking. Students explore the historical, ethical, stylistic, and socio-cultural significance of literature, using methods based on critical theory to sharpen their interpretation of texts. All courses can be taken online, although UMUC also offers several hybrid options for online learners who live near campus and want to attend occasional classroom courses. The online English degree requires students to complete a total of 120 credits, including a 36-credit English core and 46 credits of minor and elective coursework. The English core consists of 12 courses, including foundational studies in genre, English grammar, and critical approaches to literature. Students also investigate specific literary periods, beginning with Renaissance literature and moving through romanticism, modernism, and postmodernism. The English department boasts an articulation agreement with UMUC’s master’s in teaching program, enabling English majors to complete some credits for both degrees simultaneously. The program curriculum ends with a capstone seminar in English language, literature, and writing. During this culminating experience, students reflect on previous coursework and projects to create a comprehensive portfolio. The capstone also prepares English majors for life after graduation, requiring students to identify postgraduate objectives (such as graduate school or career prospects) and reflect on the current state of English studies. UMUC is regionally accredited by the Middle States Commission on Higher Education (MSCHE). Ohio Christian University ranks among The 25 Best Online Bachelor’s in English Degree Programs! Affiliated with the Churches of Christ in Christian Union, Ohio Christian University is a small private school that serves around 3,300 students. The university’s online bachelor of arts in English offers a biblical perspective on literary study while also exploring the use of writing in academic, public, and professional contexts. The program is available fully online or in a blended format. The degree curriculum features a minimum of 36 English credits, divided between 15 credits of core courses and 21 credits of electives. The program core introduces fundamental topics in literary analysis along with surveys of British and American literature. Electives explore topics in literature and composition, and students complete at least nine credits from each category. The composition section includes options such as editing essentials and professional and technical writing, while the literature section offers courses in Shakespeare and the 18th century novel. All OCU students must also complete a 12-credit component in the Bible, theology, and leadership, which covers a survey of church history and Christian ethics. The program ends with a capstone course in writing for publication, which explores strategies for publishing in academic and literary journals. The class covers both traditional and emerging forms of publication, emphasizing how newer technologies influence publication practices. Students also build their peer review skills and develop a partial manuscript for potential future publication. OCU is regionally accredited by the Higher Learning Commission (HLC). Columbia College ranks among The 25 Best Online Bachelor’s in English Degree Programs! Based in central Missouri, Columbia College is home to a popular online program that enrolls more than 5,100 students from around the country. The school’s online bachelor’s degree in English literature requires no campus visits; however, the program does also offer hybrid options for students who reside near campus. English students complete at least 42 major-related credits, including a 24-credit core and 18 credits of electives. The core component builds foundational skills in literary criticism and composition with courses such as writing about literature and literary theory. Survey courses also introduce the major figures and movements in British and American literature. The electives section requires two courses in world literature, and students select from a variety of options to complete the remaining credits, exploring different styles and genres. Students at CC can also pursue standard or advanced English internships, worth three elective credits each. These courses give English majors the chance to gain hands-on experience in a relevant professional environment, such as publishing or journalism, where they observe some of the real-life applications of an English degree. All undergraduates complete an additional 31–34 credits of open electives, typically focusing on advanced English, composition, and/or journalism courses. Online learners benefit from an assortment of student support services, including access to academic advising, career services, and military services. CC is regionally accredited by the Higher Learning Commission (HLC). Mercy College ranks among The 25 Best Online Bachelor’s in English Degree Programs! Mercy College, located in Dobbs Ferry, New York, is a Roman Catholic-affiliated college that offers a primarily online bachelor of arts in English. The program requires students to complete 18 credits of coursework on campus, but the remainder of the 120-credit curriculum is available online. Students pursuing this online English degree complete 36 major-related credits, beginning with three foundational classes, including two English literature survey courses. Learners then take at least one course from each of the program’s four major elective sections: classical texts, social and cultural contexts, literary genres, and historical periods. Each section offers an assortment of course options. For example, options from the social and cultural contexts section include Latin American literature, Caribbean literature, contemporary African literature, and contemporary Nobel literature. Mercy also offers a concentration in language and writing that requires candidates to complete 12 credits of writing courses, with options such as business writing, introduction to playwriting, applied English grammar, and writing for the web. For candidates interested in pursuing a master of arts in English, Mercy offers a four-plus-one program that lets undergraduates get a jumpstart on their graduate studies. Qualified English majors who hold a GPA of 3.0 or higher can apply to the master’s program during their junior year to take advantage of this accelerated format. Mercy is regionally accredited by the Middle States Commission on Higher Education (MSCHE). Texas State University ranks among The 25 Best Online Bachelor’s in English Degree Programs! Based in San Marcos, Texas State University offers a blended bachelor of arts in English program that mixes online and campus learning with most courses taking advantage of online instruction. Many classes use less than 15% campus-based instruction, which generally takes the form of orientation sessions or exams. These courses require very few trips to campus, and visits typically occur only at the beginning and/or end of the semester. However, other courses use a hybrid format where up to 49% of instruction occurs on campus. This online English degree offers several concentration options, including creative writing, writing and rhetoric, film, and teaching. Each concentration pathway includes different elective requirements taken from four main categories: British literature; American literature; world literature; and forms, language, and writing. All students complete at least one course from each section, but specialization pathways require additional courses from certain sections. For example, students in the creative writing track take three writing courses and focus on either fiction or poetry. Learners can also select a general track that includes fewer required courses and more free electives. Texas State also requires all English majors to select an approved academic minor, with options that include communication studies, history, journalism, writing, and women’s studies. Texas State is regionally accredited by the Southern Association of Colleges and Schools Commission on Colleges (SACSCC). Robert Morris University–RMU Online ranks among The 25 Best Online Bachelor’s in English Degree Programs! Located in Moon Township — a suburb of Pittsburgh, Pennsylvania — Robert Morris University is a private school that enrolls more than 5,000 students annually. RMU is home to one of the state’s top online education programs, including a professionally focused bachelor of arts in English that explores the intersection of literature and professional writing. The program uses a fully online delivery model with no required campus visits. This online English degree splits its major curriculum evenly between English courses and professional writing courses. The English component builds knowledge and skills in language and literature with courses covering key topics such as American and British literature, women in literature, Shakespeare, and the teaching of writing. Alternatively, the professional and technical writing section explores the business side of the field; students take classes in document design, introduction to web page development, information gathering for journalism, and technical editing. All students also complete an internship that builds experience in a relevant professional industry, such as business, journalism, or publishing. This three-credit internship offers participants the chance to apply classroom skills in a professional setting. RMU provides online learners with an assortment of support services, including student counseling, career advising, wellness counseling, and financial aid counseling. Student counselors assist with enrollment, course selection, degree planning, and other academic issues, while career advisors connect students to internships, networking opportunities, and job resources. All online learners also have access to 24-hour technical support. RMU is regionally accredited by the Higher Learning Commission (HLC). Indiana University East ranks among The 25 Best Online Bachelor’s in English Degree Programs! A regional member of the Indiana University System, IU East serves around 4,500 students from its campus in Richmond. The school also hosts popular distance programming, including an online bachelor of arts in English with an emphasis in technical and professional writing. Unlike many other online English degrees, this program emphasizes the professional applications of writing to prepare graduates for careers in advertising, public relations, social services, or publishing. The major-related curriculum consists of 60 credits and is typically completed over the course of two years. Online students generally take six credits during the summer semesters and 12 credits during the fall and spring semesters. Courses encompass composition, rhetoric, and literature, with noteworthy offerings in American culture, advanced technical writing, Native American literature, and digital writing. Students end the program with a senior seminar in professional and technical writing, which requires intensive study of a modern issue in technical communication. All degree candidates also complete a culminating writing project as part of the seminar. Due to IU East’s professional focus, many English students complete internships, engaging in hands-on learning and networking in a professional writing environment. Online students may be able to arrange these experiences within their own community or through the university’s numerous partner organizations. Past English majors have interned with grant writing organizations, nonprofits, and businesses. IU East is regionally accredited by the Higher Learning Commission (HLC). An online bachelor’s degree in English literature, rhetoric, or other concentrations will help you become a master of language. You will not only learn how to use the language correctly, but also how English has changed over time. Literature, communications, and technical writing make up common concentrations within English degrees. With a concentration in literature, students may focus on certain authors, genres, or periods. Some programs may focus on technical aspects of the language, intending to make students into better communicators or editors, while others use a more creative approach. Most programs involve a lot of reading, writing, and discussion to encourage critical thinking. Every online BA English degree differs, and the exact courses vary from one institution to the next. However, course commonalities exist within the study of the English language. Below are three examples of courses you can find within these programs. Race, ethnicity, and literature: Literature is an important part of nearly every culture, and this course explores how literature relates to, presents, or reflects race and ethnicity. Students may focus on the topic broadly, or look at specific periods, genres, or ethnic groups. Readings courses: These courses cover a wide variety of topics, often changing from one semester to the next. Reading courses look at a specific writer, genre, or historical period. They investigate how specific authors or texts relate to their time period, how they have changed, or how they have been read and criticized. Medieval and early modern literature: These courses explore some of the earliest literature in the English language in order to investigate language evolution. Many authors and texts from these eras have impacted how English has changed over time and still impact the way we use language today. Students who complete an online English degree can go on to a variety of careers, including communications, journalism, fiction, or screenwriting. Students pursuing most any job that requires writing or editing in any form can benefit from an English degree, and graduates can work in almost any field. Editor: Editors plan and review written material in print or online format, and often revise material for publication. They must be familiar with grammar and other technical details of writing, while keeping in mind the specific needs of the media and their audience. Writer: Writers create and develop written content for a wide variety of media, including web copy and fiction. Writers need to be able to craft narratives or descriptions that appeal to readers and make sense, with the flexibility to meet different needs for a variety of clients. Technical Writer: A technical writer creates manuals, guides, and other written content that communicates complex information to consumers. They must be able to translate the ideas of specialists into more accessible language, with an attention to detail, clarity, and emphasis on correct grammar and structure. Accreditation is an important part of the academic system. It ensures that colleges and universities hold qualifications to teach students and grant degrees. Regional accreditation agencies tend to focus on academics and nonprofit schools, such as public and state universities. National accreditation focuses more on trade schools and for-profit institutions. Since most schools fall into the first category, regional accreditation is quite common. Many institutions hold accreditation from multiple organizations. When looking at potential colleges to earn an English degree online, make sure that you choose an accredited institution to ensure that your degree or earned credits will be accepted by employers or other colleges in the future. Online English degree programs can lead graduates into a variety of professions. No matter what field you work in, professional organizations can help launch and advance your career. These organizations bring professionals together online through newsletters and other publications, and also in person through conferences and other networking events. Members can share findings and experiences, promote the field, steer it into new directions, and create lasting professional relationships. Modern Language Association: The MLA brings together scholars, teachers, and other professionals who work with the written word. Their style guide is used by academic professionals across a variety of disciplines. Rhetoric Society of America: The RSA focuses on rhetoric across multiple fields and professions, bringing together professionals to share their findings and encourage new research. American Communication Association: The ACA brings together professionals in any field related to communication, with ideas to facilitate research, criticism, and professional development.